Find over 30 readable cross stitch alphabet patterns that you can make your own! Whether you need letters to complete your design or your letters ARE the design, these alphabets will help you to create truly unique and treasured keepsakes. As the name implies, line alphabets, like "Mini Line" and "Fine Line," have letters that are are constructed entirely with back stitches. This doesn't mean, however, that there is no style to the alphabet. Line letters do not have to be plain. Check out "Flourishes" It has stylized tips and swirls and portrays a completely different feel than either Mini Line or Fine Line. Made with full and partial cross stitches. The lines of each letter in a block alphabet can be primarily a single stitch wide, like in "Slim" and "Addicted." Or, it may take multiple stitches to configure the letters, like "Cotton Candy." Good examples of this are "Robot" and the immensely popular "Curly Q's." The final category of alphabet patterns are those where a graphic image is used to portray the individual characters. These can be understated and graceful, like the tiny flowers on the letters of "Floral. They can be bright and bold, like our unmistakably haunted "Happy Halloween." More stitches give more opportunities to introduce more character into the characters! Start by finding a style you like and one that fits with the rest of the design, then find a way to make those letters your own! Need help fitting those letters into your design? Sometimes you find the perfect alphabet, and it fits perfectly into the space you have. But more often than not, it takes a few alterations. 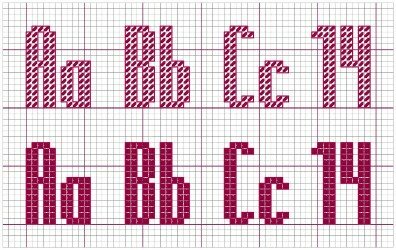 If you need a little help, check out our detailed tips on how to adapt an alphabet to a pattern, please see The 123's of the Counted Cross Stitch Alphabet. We provide our patterns in PDF format. Although it is present on most computers, if you are not familiar with Adobe Reader, click here to see our instructions page for how to obtain this free PDF reader. Now that you have sampled our cross stitch alphabet patterns, be sure to take at our other free cross stitch designs by clicking here.